It's November, the orange leaves have mostly dropped, and it's getting rainy here in Oregon. A good time to hunker down a little bit, wrap up with a blanket and a cup of warm tea, sidle up to a loved one (or the guy who just moved in), and chuck another wrestling log onto the fire of life. First thing's first, which is that wins and losses are about to matter in WWEland, as a tournament for the WWEWHW Chompyunchiaw will soon be underway. I don't even know who's in it, but I am looking forward to seeing what happens. We've been speculating up a storm, we've got some hopes and some fears... As Poncho postulated, my main fear is that Cena or Reigns win the finals clean. 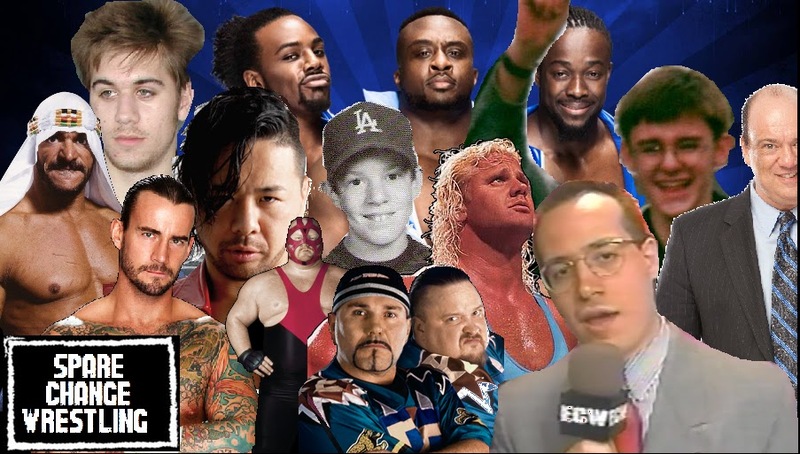 Personally, my main hope is that the tournament will include every member of the roster, making Survivor Series a grueling 5 to 6 hour wrestlethon. Actually, my hope is that DBD returns. Maybe WWE is keeping him on the shelf/off TV for some stupid corporate reason, and maybe they're just keeping him in their back pocket. An ace in the hole. We'll see. And that wouldn't be the best use for him anyway. Oh, it's tonight isn't it? This post may need to be written in 2 parts. I'm only half-way through New Japan's Power Struggle, which was going to be my primary focus. It seemed like the first half of the event featured 80% of the performers. Two four-on-fours, a three-on-three, a regular tag match, and one singles match. Not much to say about the big multi-mans, they were all fun in their own ways, though fairly low-stakes. A few title matches are teased/set up for the next event or Wrestle Kingdom (or is Wrestle Kingdom the next one?) Chase Owens joins Omega's BC sect, I like them both even if they don't mesh with the rest of BC. I thought Owens deserved an opportunity after his performance in the Super Jrs in June. Everyone was good in that Bullet Club/reDRagon & Time Splitters match, though there wasn't much opportunity for anyone to shine through as an individual. Oh, and Poncho, if you change your handle to Tampico Johnson, I'm going to call you Tampon John. So, yeah, that's awesome. Matt Sydal (Evan Bourne) and Ricochet versus Rappongi Vice (featuring Trent Baretta) was easily the highlight of the first half of Power Struggle (see how I make this relatable, Rusty?). It's greatness wasn't just because of the spots, the length of match, or the plethora of kick-outs. What I liked most about this match was the pacing of the back-and-forths. It was really clever how the "upper hand" passed back and forth so quickly, and the way the momentum built was way more complex than a typical match, and especially more than a typical juinior tag match. Sydal and Ricochet really brought the best out of RPG, who usually employ more comedy, and a lighter style. ***EDIT: I just fact-checked the below story, and I was totally wrong about one or two details, but I don't intend to correct them. Feel free to "dog" me in the comments. The young man Takaaki Watanabe debuted to American audiences in 2014 for the ROH/NJPW shows. He was billed as a New Japan guy, despite being still-in-training, and not a regular part of their roster. He stayed in the US, and continued his training with ROH. Over the next year, he made sporadic TV appearances, but didn't get much attention until the ROH/NJPW shows came back around this year. With a few solid performances at those shows, he got over with the ROH faithful, and was booked for more shows and TV spots, including a run at Jay Lethal's Television Championship. This would be Watanabe's final publicized performance under that moniker. On the other side of the globe, Tetsuya Naito is shocking Japan, having completely shed his good guy, crowd-pleasing persona. Long slow entrances dressed in black, neglecting to tag in, assaulting referees and cameramen, and a bent toward inflicting damage over winning matches are the calling cards which have gained him massive notoriety in a relatively short time. He's officially a member of a heel stable in a Mexican promotion, but has been the only member to appear in New Japan thusfar. For his most recent match, against heated rival Katsuyori Shibata, it seemed a pair of Naitos had appeared to do battle. Cloaked in identical silver skull masks and all-black suits, their approach to the ring was disorienting and intimidating. Naito eventually unmasked and began the match while his second stood motionless. So motionless, in fact, that he didn't budge even while the action between Naito and Shibata spilled out of the ring and raged around him. Only in the 11th hour of the match did the second spring to motion, interfering with the match to deliver some (not so) vicious kicks to Shibata. The interloper then unmasks, revealing... Watanabe. The stage is set. November 5 2015, NJPW Power Struggle. Hirooki Goto is on the far side of an Intercontinental reign, and looking to balance his recent loss with a tick in the Win column, as well as avenge the assault visited on his BFF Shibata. 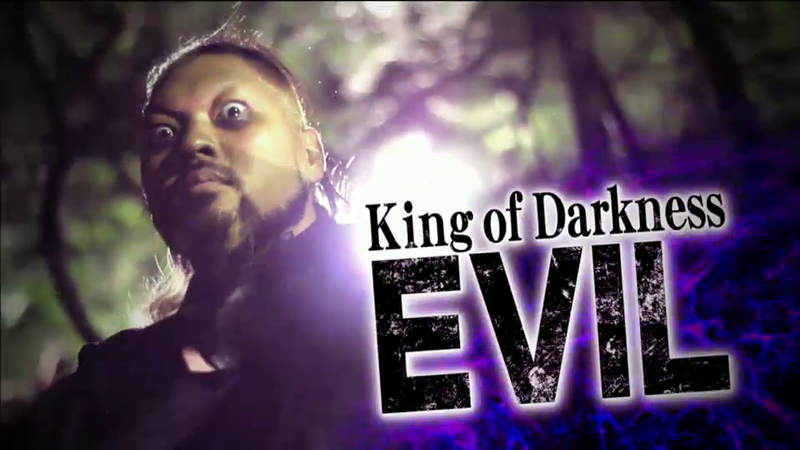 His opponent, King of Darkness EVIL, is looking to make a statement in his first singles match in New Japan. The music hits. A somber tone envelops the Osaka Prefectural Gymnasium. Now appears EVIL, here to wrestle. A hooded robe hides his face in shadow, and the aluminum scythe he's carrying lets everyone know: he's here for business... and his business is Death. Yeah, he came out looking like a sophomore LARPer, but that was just the beginning. The next layer revealed a RVD-style singlet, black, with an inscrutable black design on the front and back, and purple flames up the sides. Enigmatically emblazoned on his rear end are four Western language characters: C B J 2. The mystery deepens. A side-note: Since he was in ROH, EVIL (then Watanabe) has sported a Rollins-esque half black/half bleached head of hair, worn in a ponytail high on the crown of his head. I thought it looked fine, even sorta cool with his gear from that time, as it matched his green/gold theme. Now, in black and purple and black and black, the bleached half looks out of place. Wickedly and treacherously out of place. All this exposition and the match hasn't even started yet. Oh, and lest I forget EVIL's eyeliner, it is arranged in smudged black triangles under each eye, like a mime might apply without access to a mirror. Okay, now the match. Well, second thought, no, I can't do a play by play of the match like I've done with his wardrobe, that would be ridiculous. Suffice to say, the performance was shabby at best. The crowd booed him a little as a heel in the beginning, more when he pulled a folding chair from under the ring after one minute, then more as his technically unsharpened ringwork became transparent, and more again as he rolled his head back and made mean eyes unconvincingly. Watanabe went to ROH for a year and somehow came back a Sports-Entertainer. They cheered Goto on, but the crowd only picked up when the dastardly but outstanding Naito ran in to save his protégé from a 3 count, Shibata close behind to even the odds. Even though this was categorically bad, I had fun watching it. The inception of King of Darkness EVIL is no more the fault of its executor as the fellas who put it on paper. And regardless of the badness of his first outing, it did serve to build a story and keep Naito busy. That's all I've got for now. Part 2 will wait until I've seen Survivor Series and the rest of Power Struggle. Until then, I remain Quarter Marshall. Good night. **EDIT: Nevermind, I'm an idiot. Survivor Series is weeks away. Part 2 coming soon.